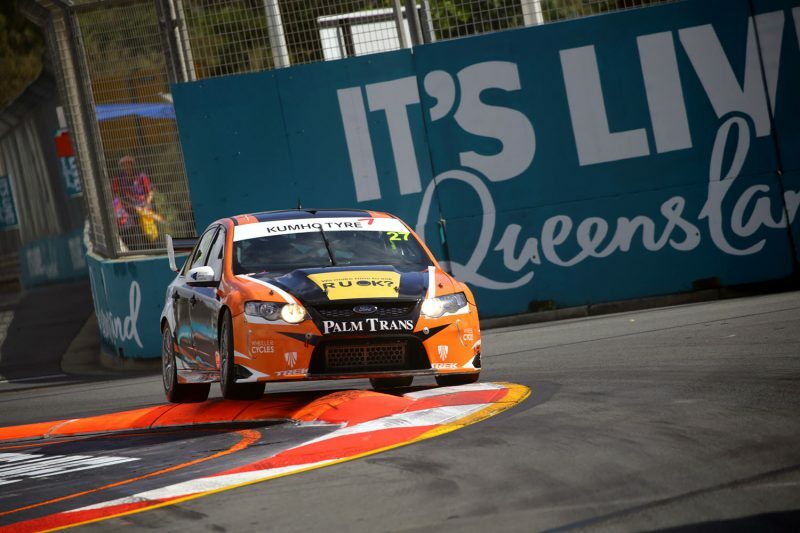 Tyler Everingham won the opening V8 Touring Cars race of the weekend at the Vodafone Gold Coast 600 despite heavy damage to his car in a race which ended under Safety Car. Jack Smith (Brad Jones Racing VE Commodore) slotted in front of pole-sitter Everingham (MW Motorsport FG Falcon) on the run down to the Front Chicane and led the opening lap while Kyle Austin (Aussie Driver Search FG Falcon) retained third. Everingham closed up on Smith at the halfway mark of the race, but lost time with a lock up under braking for Turn 1. Drama unfolded at the head of the field when Smith tripped over backmarker Stephen Coe at Turn 13 on Lap 10. Everingham, who was right behind, drilled into the side of Coe’s VE Commodore, blocking the road momentarily and leaving all three cars damaged. The incident necessitated a Safety Car and Everingham managed to carry on despite the heavy damage to the front of his car. With the laps ticking down, the race did not go back to green as Everingham took the chequered flag under the Safety Car. Austin finished second on debut ahead of McCorkindale in third, while Chris Smerdon and Michael Anderson completed the top five. The final two races of the non-points round take place on Sunday at 0915 and 1225 local time. 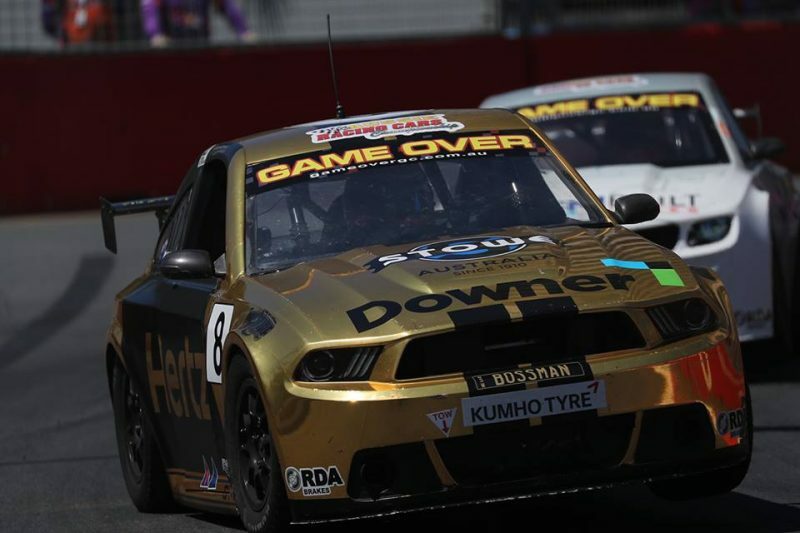 Paul Morris and Justin Ruggier split the wins in Saturday’s two Aussie Racing Cars races but it was Joel Heinrich who took a giant stride towards the title amid carnage. Morris won Race 2 in lights-to-flag fashion while Heinrich made life hard for himself with a slow start from the outside of the front row. He dropped back to fourth but ultimately reclaimed second by the chequered flag. Series leader Kyle Ensbey ground to a halt while running fourth on the final lap, which was under the control of the Safety Car, due to an electrical problem. Kel Treseder’s fading series hopes were extinguished altogether when he racked up a second straight DNF as he spun at the Hairpin and was hit by Craig Thompson before being t-boned by Brendon Tucker. Ruggier finished fourth and therefore started seventh for Race 3 but made his way back to fourth by the time the first Safety Car came when Jonathan Bloxsom spun at the Beach Chicane. He only needed the restart lap to pick off Charlotte Poynting and Reece Chapman before going underneath Tyler Owen shortly before a second Safety Car was called. That was necessitated when Poynting spun into the wall at Turn 11 and Treseder, who had driven from outside the top 20 to sit seventh, was delayed as a consequence. Ruggier successfully negotiated the final-lap green flag run to the finish, Morris took fourth, and Treseder clawed his way back up to 10th. Ensbey, however, had already pulled off with a technical problem again and therefore leaves Heinrich poised to win the series when the final race of the season is run on Sunday at 0945 local time/1045 AEDT.